I have examined “The Shaver Mystery” which is mentioned in the introduction above (and was all the rage in the 1950’s) in this blog before. 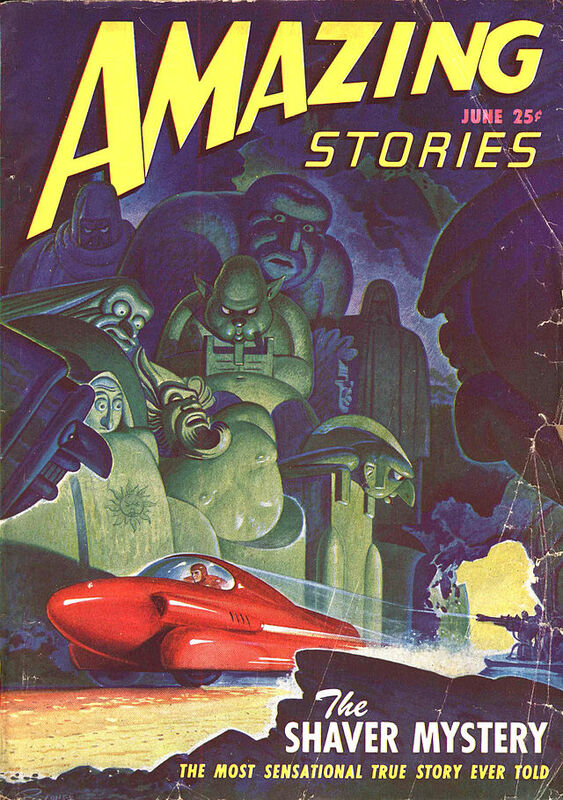 It is a vital part of the history of “Amazing Stories”, the magazine whose article we are reading today. The story of ‘The Shaver Mystery ‘also possesses fascinating parallels to the origins of dianetics and an insight into Malzberg’s hostile attitude towards Scientology 10 years later. Consequently, I will describe the Shaver aberration from the 50’s before we turn to the 70’s article about Scientology. In 1945 (only 5 years before Hubbard published “Dianetics” in “Astounding Science Fiction”) “Amazing Stories” temporarily boosted its circulation by publishing some wild claims written by a contributor in collaboration with the editor, which were then heavily promoted by the magazine. Initially, an article attributed to Richard Sharpe Shaver appeared in “Amazing”which claimed that the electrical coils in the welding equipment Shaver was working with had somehow attuned his mind so that he could receive the thoughts of his workmates – and also those of malignant entities who lived in an unsuspected subterranean world. These ideas were gradually elaborated into a paranoid cosmology. It described an ancient, malicious and degenerate race, which was living in underground cities and interfering with humans via ‘mind rays’. A constant stream of Shaver stories led to a boost in circulation for “Amazing Stories” and a brief fad for “Shaver Mystery Club” societies, consisting of people who took these claims seriously, in the manner of today’s conspiracy theories. It’s important to understand that, although this material was published as fiction, the magazine presented the ‘Shaver’ stories as literal truth, and readers argued to and fro in the letters pages. Whatever it was, it certainly polarised opinion among the community of science fiction fans, and sold magazines for a while. It was the first notable example of some fans losing the distinction between creative fiction and reality and choosing to things that had evidently been made up because this made their lives more interesting and exciting – a phenomenon that is closely examined here. There are obvious parallels between “The Shaver Mystery” and the fad that occurred only 5 years later, when L Ron Hubbard’s “Dianetics” article was published in the iconic May 1950 issue of “Astounding Science Fiction”. This also took place with the enthusiastic support of the magazine’s editor, temporarily boosted circulation, but ultimately damaged the reputation of both magazine and editor ( more details here). Both the Shaver’s stories and Hubbards dianetics inherently implausible and totally unsupported by evidence. However a significant number of readers ‘wanted to believe’, and consequently uncritically accepted the incredible claims made. The editor of “Amazing Stories” in 1970 around 20 years after his publication had blotted its copybook with the”Shaver Mystery”, seems have taken the line that ‘Shaverism’ and dianetics/Scientology were examples of the same phenomenon. Scientology, of course, was having far more serious consequences because it had become established and spawned a bizarre pseudo-religious organisation that had survived, at the time of publication, for more than 10 years, and was showing no signs of collapsing. The author begins with an account of his sitting opposite 17-year-old Hector (who had been “referred to the Scientology Center by a friend”) engaged in TR0 – a ‘training routine’ in which two partners sit facing each other on straight-backed chairs and stare fixedly, without moving. He is evidently not kindly disposed towards Scientology from the get-go. His embarrassment at becoming involved in a new “Shaver Mystery” weighs heavily upon him. After an interminable time the girl [supervisor] says that we may stop. She asks use what our sensations were. How we felt. What we learned. It was very interesting,” Hector says. “It was like it wasn’t real. At the beginning I wasn’t concentrating but then I was. It’s very strange. Hector’s feeling of unreality is pretty much a textbook example of his having entered a state of dissociation – which modern research is readily induced by contriving to experience utter unchanging sensory input (for example by staring fixedly at an unmoving object) and especially by staring fixedly at another human face (failing that, a mirror will do). He was lucky – many people experience full-blown hallucinations. Malzberg describes the Scientology ‘supervisor’. […] Hector goes to see the Registrar. It’s remarkable how little Scientology changes over the years (or in different cultures). 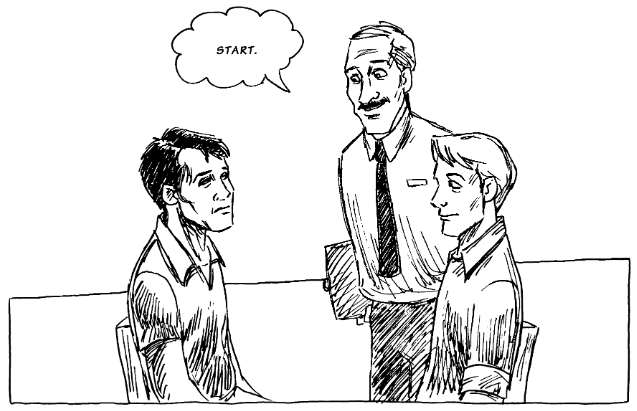 Potential recruits today are still treated to a ‘lecture’ followed by a staring contest. 17-year-old boys are still likely to be guided through that process by pretty girls. They are certainly all sent to the ‘Registrar’ where they book their first paid course and hand over the money up-front. 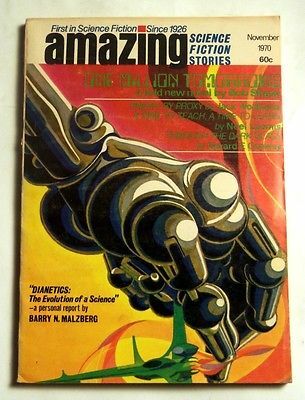 Next, Malzberg presents the almost mandatory potted history of dianetics and Scientology – but with great emphasis upon the enthusiastic involvement of John W Campbell Jr, (the editor of “Astounding Science Fiction”) in its genesis. Campbell gave dianetics a flying start by heavily promoting the ‘subject’ in his magazine both before and after L Ron Hubbard published several articles about it including the May 1950 issue which started the dianetics fad. What was going on here? What was this business of cycles anyway? Was there indeed no sense of history? Could generations not address one another over a period of twenty years? I interpret this to mean something like – ‘this dianetics nonsense is ‘the Shaver Mystery’ all over again – except that it has lasted for 10 years, and is doing harm. Why don’t people learn from the mistakes they made about Shaver’s claims, instead of falling for it all over again, in the form of dianetics and Scientology? Malzberg now backtracks, and describes how he came to be in a Scientology organisation. The ticket had been handed me on 72nd Street by a tall, slender young man with pimples. My wider had gotten one at the same location six hours later which indicated that any real proselytory fervour was being backed by some kind of industry. As noted above, nothing about Scientology seems to change. People still hand out masses of leaflets on the streets, and it is typically a highly organised and regulated business. The Registrar – I found out later he was the Registrar -handed me a paperback called Problems of Work and directed me to a small dark room in which a movie was being shown to a rows of empty seats. Scientology still hands out tickets to see free films. There have been some small, enforced changes – the films are more recent (often because the actors in the previous versions left Scientology, meaning they could no longer be used) and they shown on video. However, the basic procedure remains the same in 2017. The film is an aged, black-and-white interview of L Ron Hubbard by a rather stiff Britisher […] the interviewer is only seen in vagrant flashes of questions […]. Malzberg was evidently not impressed. After some desperate comments about it’s poor quality, she tries to take control of the situation, and steer the audience of two in the right direction, describing the supposed difference between dianetics and Scientology. Dianetics is to make you well, to clear out the charges, to relieve you of engrams. Scientology enables the already well person to communicate, to live in society. We talk now about Scientology and the Communication Course. Malzberg now ponders the promises made about how the state of ‘clear’ can be achieved in two years – and notices something about dianetics that many people miss, now that psychoanalysis has fallen out of fashion (and considered by many psychologists to be pseudo-scientific). […] The whole thing sounds very much like Freudian psychotherapy as it might be interpreted by a semi-educated science fiction writer trying to see it as he sees most other things, as a kind of machinery. The story continues to describe Malzberg and Hector’s encounter with TR0 again. While Hector is with the Registrar Malzberg talks to the ‘girl’. She has been involved in Scientology for the past two years, is not yet Clear but working toward it, presently has fallen a bit behind in some of her academic courses at NYU. 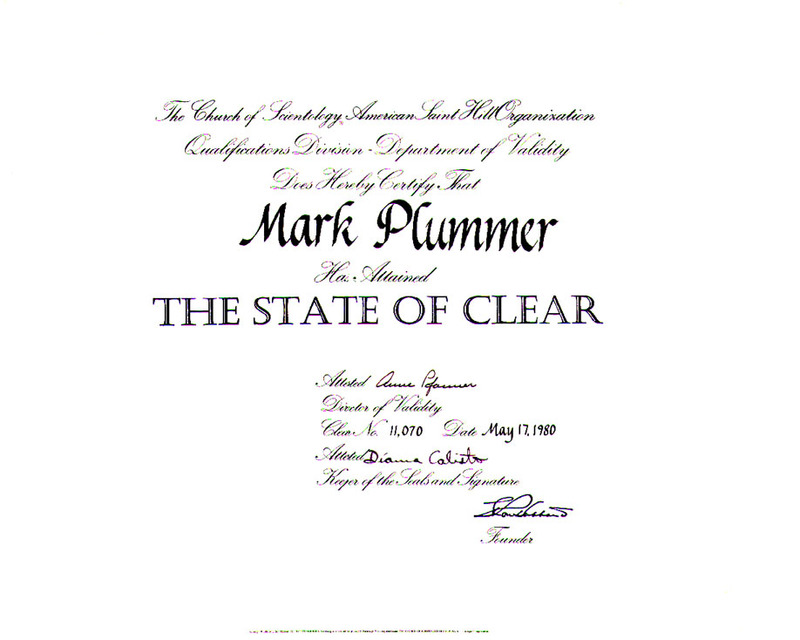 Once again, Scientology today targets students, insecure and away from home by offering them an apparently easier course to self-esteem through accumulating the fancy, but worthless certificates passed out by Scientology Orgs. Many an academic career has failed at the onset because Scientologists muscled in and disrupted the motivation and application required to earn a degree. There follows passage describing Malzberg’s discussion about “The Problems of Work” with the Registrar including a failed attempt to sell the whole ‘Communications Course’, after which Malzberg walks away from Scientology. The article was obviously conceived of a way For “Amazing Stories” to make reparation for the ‘Shaver Mystery’ debacle – and incidentally get in a dig at the rival “Astounding” for having made substantially the same mistake. It was a forgone conclusion that it would be hostile to Scientology. L Ron Hubbard was a pilot during the Second World War. I understand that he flew many dangerous missions and was awarded a distinguished service cross just before his disability discharge. Even Scientology, which has lied extensively about Hubbard undistinguished career in the US Navy has never claimed that Hubbard was a pilot, flew combat missions or was decorated with that award. This seems to be something that a Scientologist made up on the spot to impress the new prospect. There are other errors, including the mistake that the E in e-meter stands for “engram” (it’s actually a contraction of the pseudo-scientific label, “electropsychometer”). 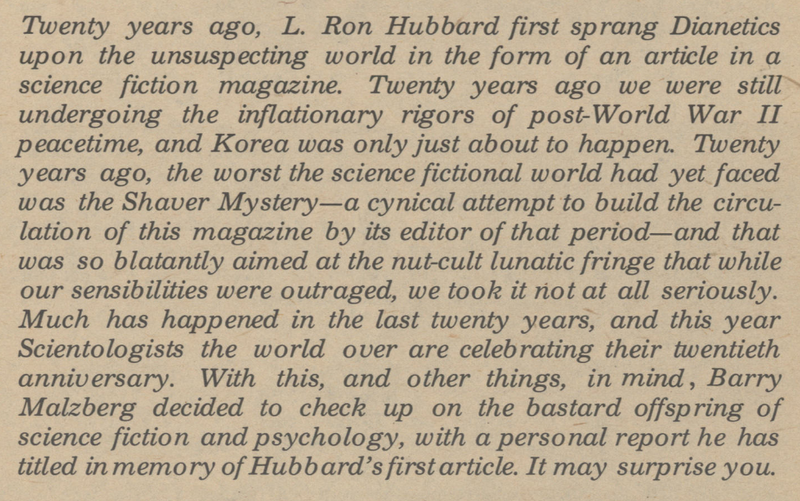 […] re-reads the August 1950 issue of Astounding Science Fiction [available here] in whose letter column are presented the first reposes to the long article of May 1950. L Ron Hubbard has 2,000 words thanking readers for their “Blazing response… which has justified a lifetime of work” and notes that of some 1,000 card and letters only three were unfavourable and those written by graduate psychology students obviously afraid of losing their jobs and the benefits of hard training. The letters column makes interesting reading. Hubbard’s claims are highly questionable – but what he writes next next, is downright creepy. It is inevitable, Hubbard notes, that as the result of the introduction of Dianetic therapy, some one-forth of the human race will shortly become dominant over the remaining three-fourths and thus control the destiny of the globe. Fortunately, the fact that this master race will show far more compassion that could be other wise expected, will avoid the possibility of genocide of non-Clears. Malzberg goes on to describe the rest of the issue (unsurprisingly he is not impressed by the stories in a rival magazine) and draws the article to a close.